CUET Admission Result 2018-19 will be found on this website. CUET has been published admission session 2018-19. CUET admission test held on 2nd October 2018. CUET Admission Result will be published 17th November 2018 and also published waiting list of admission candidate. The Admission committee of CUET announced this year total 841 (eight hundred forty-one) Student will be admitted this session 2018-19. The admission test was taken on four subjects: Math-200, Physics-200, Chemistry-200 & Functional and Comprehension English-100. Additional free-hand drawing exam was taken for Architecture for 400 marks. Timely all University Admission Result 2018-19 update here. Through a Government ordinance in 1986, the college was converted into an Institute of Technology. In 2003 this institute of technology was converted into a public university. The honorable President of Bangladesh is the Chancellor of the University. If you get your admission result then visit this website. CUET Admission Result 2018-19. 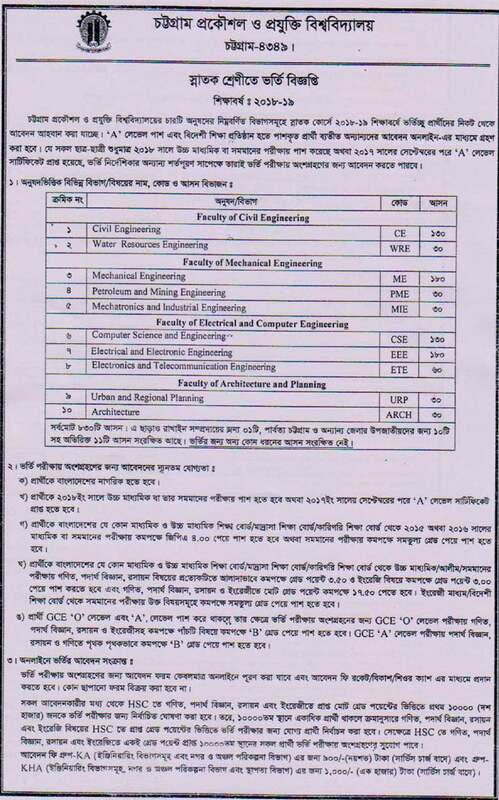 Chittagong University of Engineering & Technology abbreviated as CUET Admission 2018-19, is one of the prominent and prestigious degree awarding institutes in the engineering education of Bangladesh. This University was created out of Engineering College, Chittagong that was established in 1968. The Engineering College, Chittagong, functioned as the Faculty of Engineering of the University of Chittagong. Though a Government Ordinance in 1986 the college was converted into an institution (BIT, Chittagong).The honorable President of Bangladesh is the visitor of the institute. CUET Admission Result 2018-19.